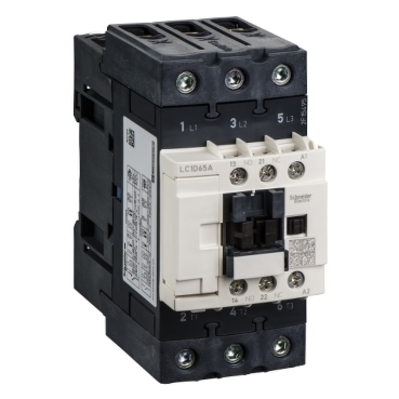 Detailed Description: Schneider Electric / Square D TeSys 3-Pole Non-reversing contactor measures 4.65 Inch x 2.17 Inch x 4.61 Inch and has a current rating of 65/80 Amps. Coil has a voltage rating of 24 VAC at 50/60 Hz. It is suitable for use with TeSys D contactor and direct mounting to LC1D. It has a one-phase power rating of 3 Hp at 115/120 VAC and 7-1/2 Hp at 230/240 VAC. It also has a three-phase power rating of 15 Hp at 200/208/230/240 VAC and 40 Hp at 460/480/575/600 VAC. Relay has a saddle clamp modular terminal block and mounted on 35mm DIN rail. It has a power rating of 30 kilo-Watts at 440/500 VAC, 25 kilo-Watts at 415 VAC, 33 kilo-Watts at 690 VAC, 22 kilo-Watts at 380/400 VAC and 15 kilo-Watts at 220/230 VAC. Control/power accommodates a wire size of 12 - 20 AWG and 2 - 16 AWG. It has a full load inductive and resistive of 65/80 Amps. Wire guides/captive screw is inclined and has open enclosure. It has a IP20 touch-safe with terminal cover that can be easily removed. It is suitable for industrial motor control applications. Contractor meets UL,CSA and CE standards.